Thinner and thinner smartphones seem to be the trend lately, and one that many people complain about. But iPhones have actually gotten thicker over the last few years, mostly thanks to beefier hardware and added technology. Those complaints certainly had some merit several years ago—from the iPhone 3GS to the iPhone 6, overall device thickness decreased by 44%, from 12.3mm all the way down to 6.9mm. Phone thinness used to be a bragging point for manufacturers—and it still somewhat is—but in this day and age, a super-thin phone isn’t something to boast about unless it can also deliver good-enough battery life. And therein lies the true challenge when creating a thin smartphone: battery capacity and battery life. The thinner you make a smartphone, the less room you have for the battery and other components. Sure, you can try to make all of the circuitry smaller to fit in more battery, but the battery already takes up a majority of the space inside a phone, and the circuitry can only get so small. Surprisingly, though, while iPhones were getting thinner and thinner between 2008 and 2014, battery capacity was steadily increasing, and it still is to this day. The iPhone 3G had a 1,150 mAh battery, and through the years that increased to a 1,810 mAh battery in the iPhone 6, even though the phone itself was much thinner. This doesn’t necessarily mean that physical battery size increased by that much, but the more milliamp hours (mAh) in a battery, the better battery life, theoretically. In fact, from the iPhone 3G to the iPhone 6, talk time increased from 5 to 14 hours. Internet use over Wi-Fi increased from 6 to 11 hours. Video playback increased from 7 to 11 hours. And audio playback increased from 24 to 50 hours. Of course, it’s great that battery capacity and life has steadily been on the rise, but it’s safe to say that if Apple wasn’t so gung-ho on making iPhones as thin as possible, they probably could’ve squeezed in even more battery capacity than they did during that era. The good news is that Apple finally seems to be getting to the point where phones can’t get any thinner, at least for now. Better yet, rather than just keeping new iPhone models at 6.9mm (the thickness of the iPhone 6, which is the thinnest-ever iPhone), iPhones have gotten progressively thicker. As you can see in the graph above, starting in 2015 with the release of the iPhone 6S, iPhones have continuously been getting thicker, and batteries have gotten much bigger. 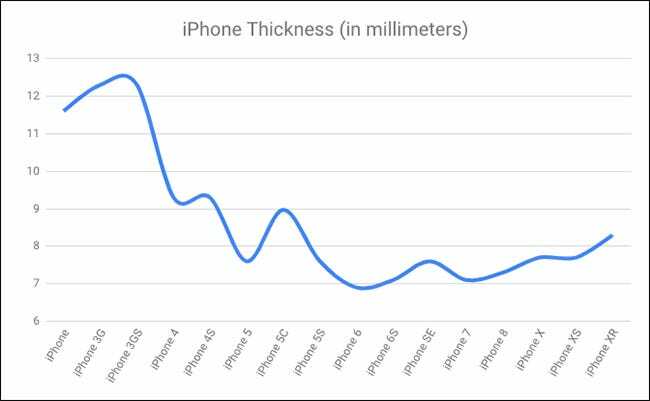 From the iPhone 6 to the iPhone XR, overall thickness has increased by 1.4mm. That may not seem like a lot, but that’s a healthy 20% increase in thickness. Because of that (and also thanks to the continuing advancements in battery tech), iPhone battery capacity has seen a 72% increase from the iPhone 6S to the iPhone XR—better than the 53% increase from the iPhone 3GS to the iPhone 6. Now, it’s important to note that Apple likely hasn’t been making its phones thicker so that they can squeeze in bigger batteries. Rather, it’s because of all the added technology that the company has tacked on to the iPhone over the years—bigger batteries and better battery life is likely just a bonus. The iPhone 6S is 0.2mm thicker than the iPhone 6, likely due to the addition of 3D Touch within the display. The Plus models of the 7, and 8 are also 0.2mm thicker than their smaller brethren, thanks to the dual-lens camera. The 6 Plus and 6s Plus didn’t have dual-lens cameras, but they did have optical image stabilization. The iPhone 8 is 0.2mm thicker than the iPhone 7, thanks to the addition of wireless charging and a rear glass panel (instead of aluminum). 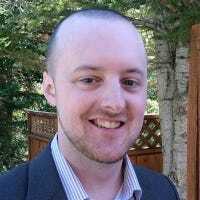 The iPhone X is 0.4mm thicker than the iPhone 8, likely because of the dual-lens camera in a smaller body than past Plus models. The logic board is also folded in half, but this is probably just to make room for a larger battery, and not the main reason for the thicker frame. The iPhone XR is 0.6mm thicker than the iPhone X due to its LCD (rather than using thinner OLED technology from the X and XS). 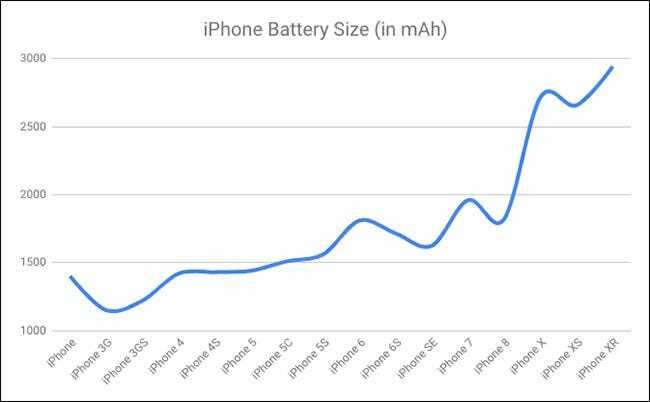 It’s also worth noting that iPhones have gotten bigger (23% increase in surface area from the iPhone 6 to the iPhone XR), so larger batteries were inevitable no matter the thickness. Plus, with faster CPUs, more memory, and larger displays, processing power on iPhones is getting more and more demanding. This means Apple is forced to increase the battery capacity to keep battery life from going down the drain. The iPhone X is a great example—that extra room for a bigger battery was likely a requirement, rather than a cool bonus feature. Because of that, while battery capacity has increased significantly over the years, battery life hasn’t necessarily followed an identical path. On average, there has only been a 48% increase in battery life—compared to the 72% increase in battery capacity—from the iPhone 6S to the XR. That’s still a nice increase, but it goes to show that larger battery capacity doesn’t directly translate to better battery life. In the end, iPhones are no longer getting thinner, even if it may seem that way—Apple still likes like to rave on about how thin their phones are. 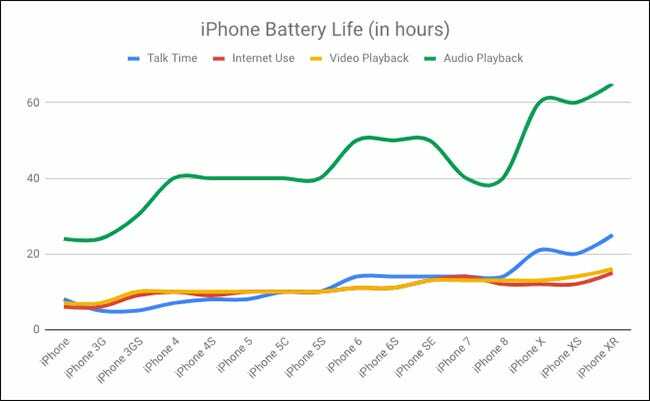 And even if thicker iPhones exist purely because of larger camera sensors and beefier components, at least overall battery life has been on an upward trend ever since the original model was released.